Tiger Woods' 15th major championship was truly special. For the first time in his career, Woods won a major when he wasn't leading after 54 holes. And it was his first win at a major since 2008, not to mention his first Masters win since 2005. All of this happened years after his battles with back problems (four surgeries) and struggling to stay healthy. Woods lit the sports world up with his win on Sunday, as Augusta National celebrated his return to the top. Woods, who won the Tour Championship last year, is clearly kicking it up a notch in 2019. 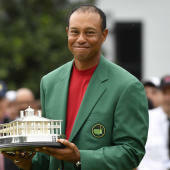 On Monday's "Off the Bench," Danny Kanell and Raja Bell talked about Woods' historic comeback to the top of the golf world. Kanell went as far as to say Woods' win was the best comeback that sports has ever seen, due to both the physical and emotional obstacles he overcame to get back to this point. "I didn't know if he would play competitively again," Kanell said. "There were certain points where I didn't think he knew if he would play competitively again. Then it's like 'can he compete? Can he make a cut?' And to get back to the point where now we've seen him actually get back to the pinnacle of the sport? That's what makes it so special. And it wasn't just an injury. It was his personal life." Woods' comeback is great for golf as a whole. To do it after such a long hiatus from the top makes it that much more special.